Chinese defense minister's India visit - one step closer to friendship? 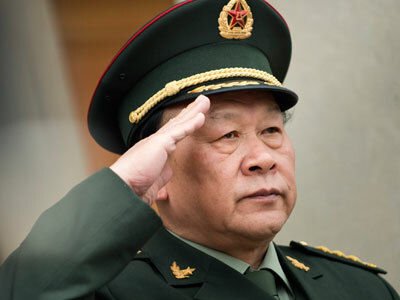 The Chinese Defense Minister has arrived in Mumbai, marking the highest-level defense visit to India in eight years. Relations between the two neighbors have traditionally been tense, but have seen a thaw in recent months. General Liang Guanglie landed in Mumbai, and is also slated to visit the capital New Delhi, where he will be meeting with his Indian counterpart A. K. Anthony. The trip to India comes as part of Liang’s tour of South Asia. “The Chinese army's efforts in conducting friendly exchanges and cooperation with its counterparts in South Asian nations are intended for maintaining regional security and stability, and not targeted at any third party,” he said in Sri Lanka. While relations between the two countries have been sour in the past, the latest high-level contacts, along with joint military drills, have indicated that the world's two fastest-growing economies may well be on their way to becoming allies. “With China itself requesting the visit, it's a significant step towards repairing the cracks in bilateral defense ties,” an Indian official told the Times of India. The two countries still have many disputes to resolve. One is that of their mutual border, which lies in the Himalayan Mountains, and was the reason for a brief but bloody war in 1962. Since then, the de-facto border has been established along the so-called Line of Actual Control (LAC). The dispute remains to the day, and Indian officials have accused the Chinese military of “transgressing” the LAC on a number of occasions in the past. India has also expressed its concern over growing militarization of the region adjacent to the border on the Chinese side. Another point of controversy between the two giants is the fact that India harbors the Dalai Lama, the exiled Tibetan leader who maintains that the Chinese rule over Tibet is illegitimate. In more recent times, the two nations have jostled over influence in the strategically important region of South Asia. Beijing’s and New Delhi’s relations with the United States and Pakistan are another issue. In the Cold War, after the so-called Sino-Soviet split, New Delhi found an ally in Moscow, while Islamabad, an adversary of India, sought to establish good terms with Washington. In the post-Cold War era, the US has become increasingly friendly with India. However, the chessboard in one of the world’s most volatile regions may change yet again. The signs showing that Sino-Indian relations are improving paint a picture of the world in which the two fastest-growing economies produce the world’s largest economic and military superpower, surpassing that of the United States.